A special limited edition of the Duncan Pulse, made exclusively for sale at Hong Kong Disneyland. "Like the [Duncan] Lime Light, the Pulse features special LED light-up technology. Unlike the Lime Light, [however,] the Pulse features a ball-bearing axle for even longer spin times and friction stickers for easy returns. Used by world champions!" 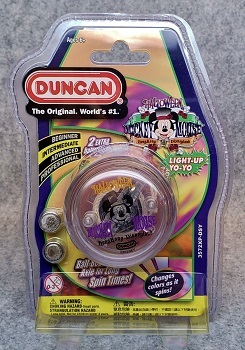 Uses Duncan Friction Stickers for response and a size A ball bearing axle.